Drumroll, please: we're planning our first ever vacation that doesn't involve visiting relatives! My husband wants to treat us when he completes his doctorate this spring. We've decided on the Smoky Mountains--fly fishing for him and Dollywood for the little one. To remind us to save for this upcoming trip, we found this big old jug and dubbed it "The Money Jar." My little one thrills to deposit found money, proudly telling passersby that he's going to Dollywood. Saving change is not a new idea, but we've never tried it in an organized way. Reaching financial goals is easier when you have a tangible reminder. With luck, we will race to fill up the money jar AND appreciate the trip's rewards in a way we would not with a credit card alone. My husband completed his PhD this month. He has saved change since he started, and we cashed it in for a long weekend in Maine this past weekend. We had a great time. Hope you do to. That is a BIG jar, and very interesting looking. Do you know what was in it orginally? I've been saving my change in a tin with a lock on it. Lisa, my mom picked it up at a yard sale. It was sitting in my spare room for months when my son dropped some Kinex down in it...and BINGO! 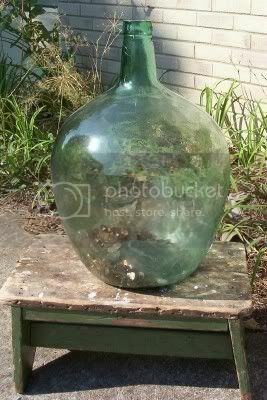 I think it might be a wine jar? I know it's handblown, because it has a giant dentil in the bottom. I live in the Dollywood area. I'm not sure when you are planning to take your trip but after the season prices will drop on the hotels but unfortunately some of Dollywood's water rides will close. The Christmas season there is beautiful but very crowded. Our favorite time is Kidsfest. If you can go during the week I hightly recommend it. We avoid it on the weekends. Also right before closing is the best time to ride some of the rides because the lines disappear. My kids enjoy the roller coaster and can ride over and over just before closing. I really enjoy the shows at the theaters, most are well done. Food is expensive. But Aunt Grannies resturant has a good breakfast buffet deal (or did last time I was there). If you hit it at the right time I think the buffet ends at 11) your breakfast serves as a lunch too. Another hint is that if you come into the park after a certain time in the afternoon the next day you get in for free. So that definately helps because your kids can enjoy the rides in the evening when it gets a little less crowded and then return the next day for free. I believe they have fireworks at night just about closing time. That is all I can think about right now. Pigeon Forge has lots to see and can become a money trap very easily. There are many resturants, shops and tourist attractions. There are also lots of outlet stores and music theaters. Three of my favorite places to eat are the Alabama Grill, they have wonderful potato soup, yum, The Old Mill resturant, good home cooking, very generous portions and they serve corn chowder and corn fritters as appetizers with every meal, The Apple Barn resturant, wonderful food. The lunch menus are much better prices. I don't eat at any of these during the dinner hour. Just a few thoughts. If you think of anything you would like to know about the area let me know. Oh...if you want to see outdoor scenery, besure to go to Cades Cove. My personal favorite place in the mountains. Early in the mornings you can see deer, wild turkey, and if you are very lucky maybe a bear. Carrie, thanks for the wealth of information! I *love* travel advice from people who live in the area. We will probably get a cabin/condo and do our own meals, but the brunch buffet idea is great. The guys will think they've died and gone to heaven (we do light breakfasts here).